After a brief introduction of the speaker and the topic by Maxime Larivé, Assistant Director of the EUC, Professor Balkir began her presentation by explaining the situation and the economic perspective she used to view and analyze the plights of Syrians, Turkey, and the European Union. Another element of her presentation was the visual presentation. Balkir implemented pictures and graphs to strengthen her points. For example, her pictures of the refugee camps in Syria presented a realistic depiction of the Syrian refugees’ situation. Balkir first discussed the events since 2011 that built up to the current refugee crisis. She described the changing relationship between Syria and Turkey, the impact of the Arab Spring, and the effect of ISIS. She then addressed the economic impact of Turkey hosting the Syrian refugees. While hosting only 25 percent of Syrian refugees, about 2.5 million dollars is spent every day by the Turkish government to aid this population. Balkir also addressed the many challenges such as education, health, shelter, employment, social issues, and politics. With regards to education, Balkir presented questions about the languages and educational systems for the refugees. Many of the refugees plan to stay in Europe, but their educational beliefs do not always agree with the Turkish government. 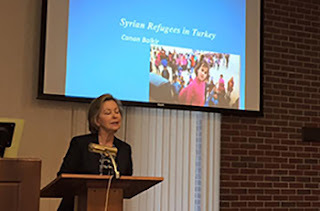 Not only did Balkir discuss the Turkish government’s relationship with the Syrians, but she also discussed the opinions of Turkey’s citizens about the Syrians. Showing statistics from the Centre for Economics and Foreign Policy Studies (EDAM), Balkir stated that about 30 percent of Turkish citizens felt that they were forced humanitarians and that refugees should be sent back to the country in its current state. Balkir was shocked that there was an increase in people saying yes to this question. Balkir finally addressed the EU’s role and response to the situation. Challenges include the slow rate of policy implementation and the current problem of terrorism. Based on the topics she discussed, it is clear that to understand how to move forward, there has to be an understanding of the current situation and the events leading up to it. The audience remained intrigued by the presentation and discussion about Turkey and Syrian refugees. These topics will be discussed again later this semester on April 28, 2016 during the Turkish Studies Symposium at the Illini Union.